This chart shows worldwide smartwatch shipments by leading vendors. Fitbit, Garmin and Samsung all introduced new smartwatch models in recently in an attempt to loosen Apple's stranglehold on the market. According to IDC, Apple shipped 3.4 million Apple Watches in the second quarter of 2017, making it the second largest wearables vendor and by far the leading smartwatch brand in the world. Considering Apple's position in the smartwatch market, it is hard to call the Apple Watch a failure as some people still do. 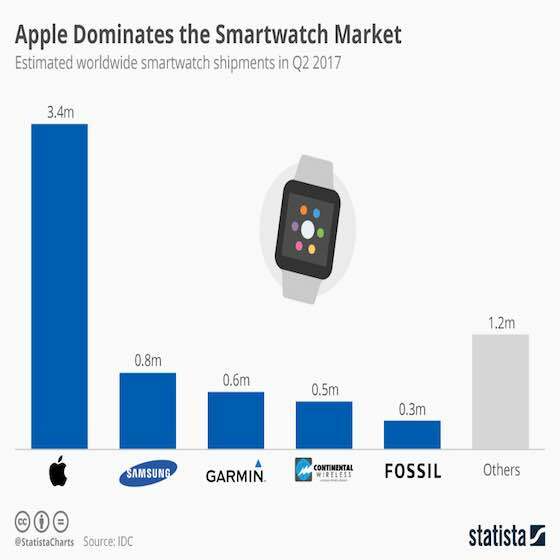 Smartwatches may not (and probably will not) change the world the way smartphones did after the iPhone's release in 2007, but the market is still young and Apple is safely on top of it. Personal Tech & Gadgets "Apple Dominates Smartwatch Market"